So yes. I chose to screen this movie. Before I walked in, I expected an absolute 91 minute eye gouging debacle. But to my surprise, it really wasn’t all that terrible. I mean don’t get my wrong. I do not ever want to see this again, but kids everywhere are going to love this movie. And it won’t be a bore to the parents either. 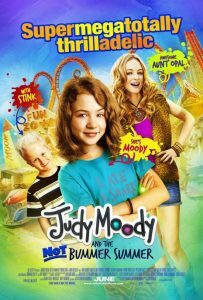 ‘Judy Moody and the Not Bummer Summer’ works for kids. They will enjoy it. In the first five minutes of the film to my delight, Jaleel White otherwise known as Steve Urkel from ‘Family Matters’ shows up. He plays the teacher to the class. And not only does he have dialogue, but he sings and plays the banjo. That made my inner child come out and laugh out loud. Not to mention that Heather Graham is in the film as well but not as ‘Roller-girl’. 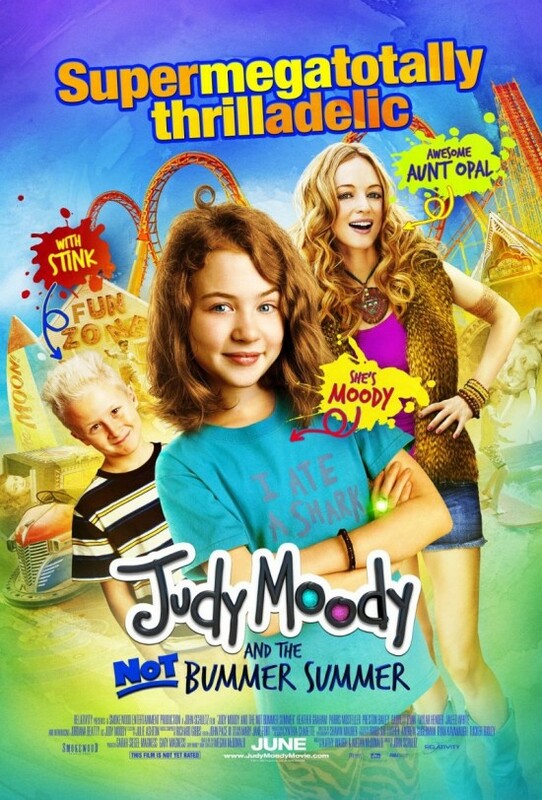 Judy Moody is based off a children’s book series that is quite popular. This particular film is about the ‘Not Bummer Summer’. Basically it is the last day of school and Judy and her friends are all very excited to be out of school. And in the past Judy has always had to spend her summer with her boring grandparents and has really never had a good time. Well this year, she is not going and so she devises a plan and chart to have the most excellent summer ever with her friends. Her char and plan is to do crazy fun stunts and adventures to which if she and her friends accomplish these feats, they will get points. Whoever has the most points at the end of the summer…WINS. Well to much of Judy’s dismay, all of her friends have plans with circus camp, traveling the world, or visiting family except one other kid in their group who is labeled as the “square” of the group. And to make matters worse, Judy’s parents are leaving for California without her or her little brother for the summer and putting Aunt Opal in charge. Things don’t look good for Judy……..until, we find out that Aunt Opal is played by Heather Graham. Opal is an artist/hippie/fun adventurous woman who lives on the fly. So Judy and Opal plan doing the Summer list to get points. Mix in there a huge sub-plot of Bigfoot sightings and you have ‘Judy Moody and the Not Bummer Summer’. The best part of this movie is Judy played by Jordana Beatty. She is excellent in the role and full of life. She really makes the film. All the other actors are sadly sub-par. Yes even Heather Graham. Now keep in mind this a kids film, so it is completely A.D.D. proof. Tons of events going on to keep the kids occupied. To the kids, the film will go by very fast, but to the adults it will feel like 91 minutes. But that’s better than two hours. Plus you get to see Urkel throughout the film. The kids will love this film. I have no doubt that after seeing this film, they will create their own lists and try to learn, be active, and have fun during the summer. Take your young ones to this. Then tell them about ‘Family Matters’ and show them Urkel. This entry was posted on Friday, June 10th, 2011 at 5:06 pm	and is filed under Film, News. You can follow any responses to this entry through the RSS 2.0 feed. You can skip to the end and leave a response. Pinging is currently not allowed. « Jason Bateman and Vince Vaughn To Star In ‘Insane Laws’?!? !